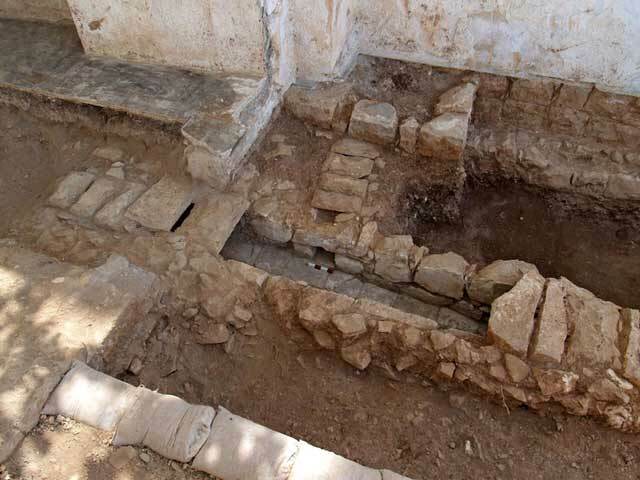 During July 2010, a salvage excavation was conducted at 57 Hanevi’im Street in Jerusalem (Permit No. A-5970; map ref. 220736/632422), prior to construction. The excavation, undertaken on behalf of the Israel Antiquities Authority and underwritten by the Shikun Ovdim Company, was directed by A. Nagar, with the assistance of E. Bachar (administration), M. Kunin (surveying and drafting), S. Ammami (field photography), N. Zak (plans), L. Kupershmidt (metallurgical laboratory), C. Amit (studio photography), and D.T. Ariel (numismatics). 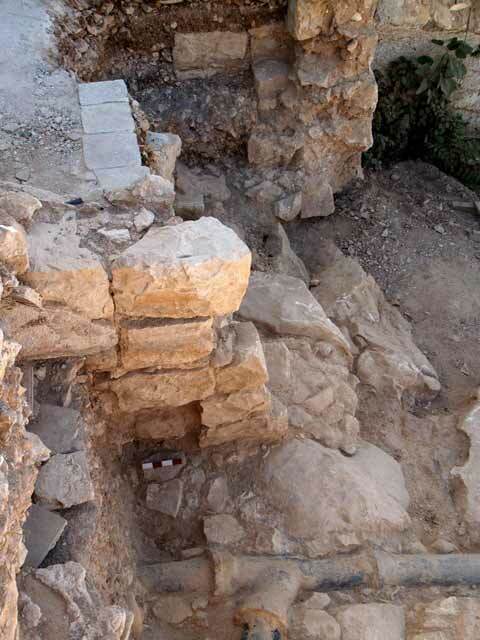 The excavation (c. 31 sq m) was conducted in the remains of a building dating to the nineteenth century CE, on a slope descending to the south; the remains were hidden beneath a parking lot, c. 30 m south of the Nabi ‘Akhasha compound. 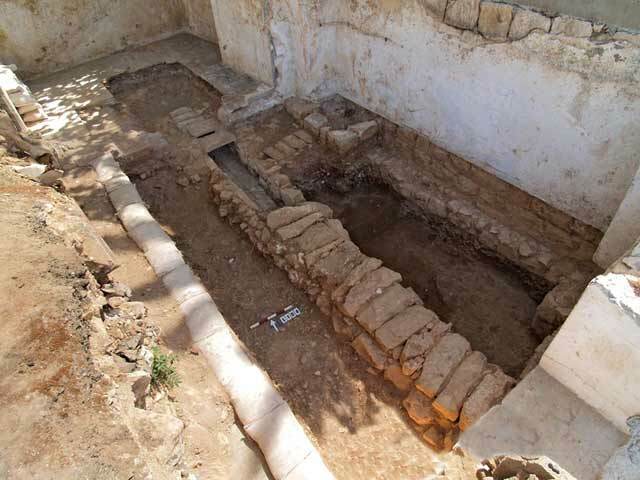 Three built drainage channels and a cistern were exposed in the excavation (Fig. 1). The magnificent house that belonged to the merchant Wilhelm Duisberg was built at the beginning of the 1870s. In the 1880s, the German consulate was seated in this building and in August 1939, it was closed by the German authorities, shortly before the outbreak of the Second World War. During the war, the building was nationalized by the British and was used as the Ministry of Labor. The Ezel organization dynamited part of the building on August 5, 1947. After the establishment of the State of Israel, the building was used by the Israel Military Industries and subsequently the offices of the Mapai party were headquartered there.In the 1970s, most of the building was demolished and the remains were covered with asphalt and turned into a parking lot. Drainage Channels. 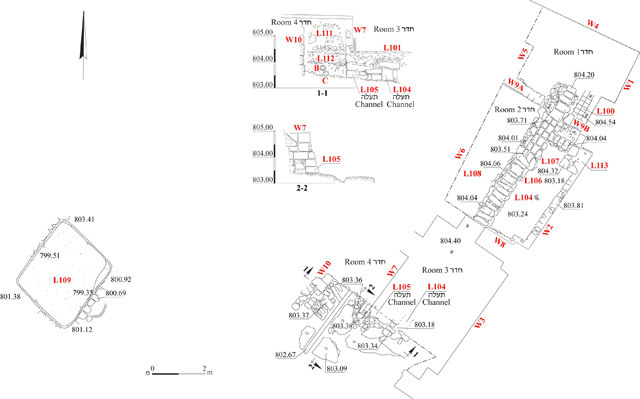 Three channels (L104, L105, L107) were exposed beneath the floors of four rooms (1–4) in the building. Channel 104 was a main drainage channel, fed by the minor channels, 105 and 107. All the channels were constructed directly on the bedrock from dressed, medium-sized stones to a height of one or two courses. Roughly hewn stone slabs covered the channels, whichwere lined with mortar containing soil and lumps of limestone. The bottoms of the channels were lined with well-dressed medium-sized masonry stones. Channel 104 (exposed length 15 m, inner width 0.45 m, overall width 0.8–1.1 m; Fig. 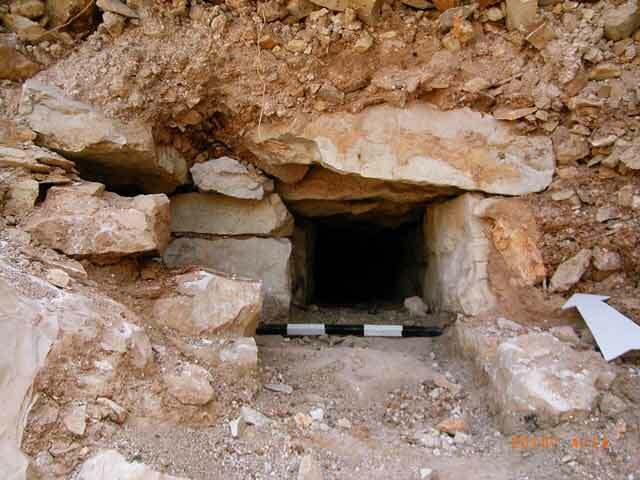 2) descended from north to south and had an opening that was built beneath Room 3 (Fig. 3). The northern part of the channel continued beyond the limits of the excavation. The channel was disturbed for a distance of c. 1.8 m below Room 2, where it was revealed without covering slabs and deliberately filled with soil and refuse from the nineteenth and twentieth centuries CE, including bones, fragments of Marseilles roof tiles, pieces of metal, glass, shells, mother-of-pearl and the head of a black painted ceramic figurine, depicting a woman wearing a hat (Fig. 4). Channel 105 (exposed length 1.5 m; width 0.38–0.45 m) sloped from west to east and drained into the opening of Channel 104. An opening incorporated in a wall (W7; Fig. 5) was exposed at the western end of the channel. A pavement of small and medium-sized fieldstones was discovered outside the opening of the channel. The pavement stones inside Channel 105 were dressed with a fine-toothed chisel. The channel was filled with soil and lumps of limestone and a fragment of modern glass was discovered in it. Three modern drainage pipes, two of metal and one of terracotta, were exposed west of Channel 105. Channel 107 (exposed length 0.9 m, overall width 0.63 m, inner width 0.19 m; Fig. 6), the smallest of the three channels, descended from east to west and drained into Channel 104 below Room 2. The channel was found filled with soil and lumps of limestone. The eastern end of the channel continued beyond the limits of the excavation. A stone-built installation (L113; 0.8×1.4 m), whose function is unclear, was exposed above the channel. Cistern (L109; Fig. 7). 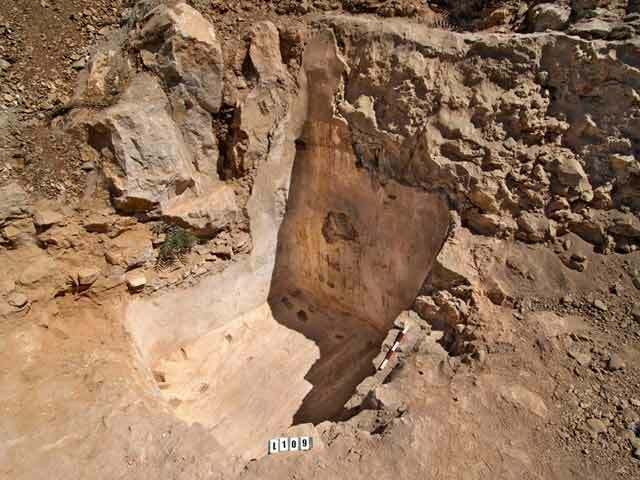 A square cistern (2.65×2.85 m, depth 4.06 m) dug in the soil was exposed c. 8.5 m west of Room 3. The northern side of the cistern utilized the bedrock and the other sides were built of two rows of stones and gray mortar; the interior row was built of large stones whereas the exterior one was composed of small and medium-sized fieldstones. The sides were coated with two layers of plaster (thickness 7–10 cm). The bottom layer consisted of light gray plaster that contained lumps of limestone and charcoal, to which small stones were affixed. The outer layer was white plaster mixed with black and red potsherds. The bottom of the cistern sloped from west to east. A blockage (width 0.63 m, thickness 0.7 m, height 1.35 m) of medium and large stones was discerned in the middle of the eastern side. This was probably the sealed shaft of the cistern. The finds from the excavation included fragments of pottery vessels, ranging in date from Iron Age III to the second half of the twentieth century CE, and three coins, two of which were identified. The two coins were discovered in fill above the bedrock in Room 2; one coin dates to the Byzantine period (383–392 CE; IAA 141077) and the other is a Cypriote or European coin from the twelfth–thirteenth centuries CE (IAA 141078). Based on the construction of the channels and their integration in the building, it seems that they were built together in the late nineteenth and early twentieth century CE. At some point in time the channels went out of use and new metal and terracotta pipes were installed in their place. The cistern is dated to the same period, based on its construction; judging by its proximity to the building, it seems that the two were constructed at the same time. 2. Channel 104, looking northeast. 3. Channel 104, opening, looking north. 4. 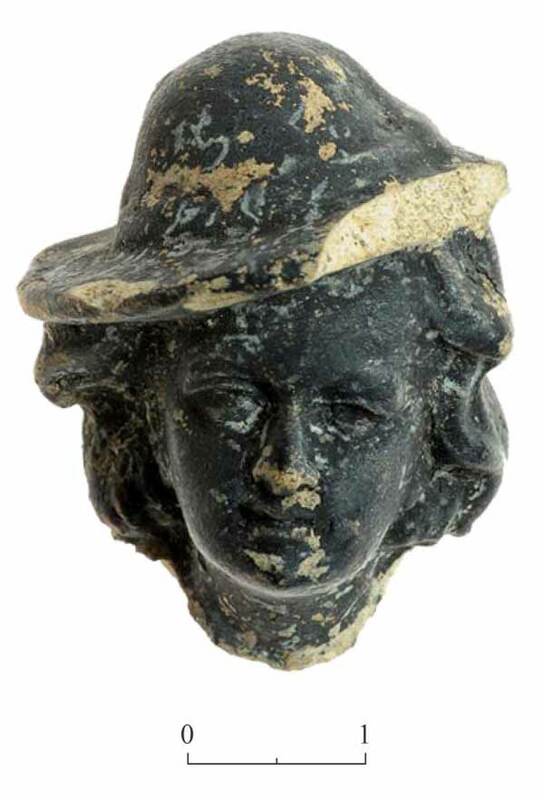 Figurine, head of a woman wearing a hat. 5. Channel 105, opening, looking southeast. 6. Channel 107, looking east.